This site has been derelict for the past year, as starting out as a new faculty at UNESP consumed all of my free time. We are now slowly transitioning to a lab webpage (https://sites.google.com/site/ecosystemobservation/), and will start blogging “for real” very soon. Stay tuned! It’s usually assumed that Synthetic Aperture Radar (SAR) images can penetrate through clouds, giving you an image regardless of cloud cover conditions. Well, that’s true…most of the time. Heavy clouds can still have an effect, especially for shorter wavelengths such as X and C bands. I was really (and nerdily) excited after looking at the image below. A big, diffuse black spot over smooth forest, that isn’t there in the images taken 23 days before or after. Granted, I’m not 100% sure it’s a cloud, but what else could it be? If you disagree, let me know in the comments! 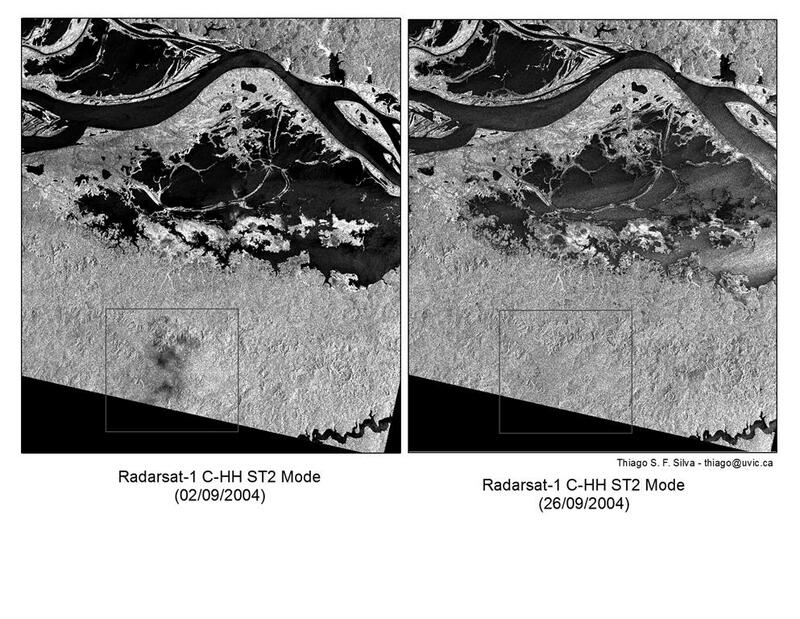 Clouds in a Radarsat-1 image of Curuai Lake, Amazon floodplain, Brazil. Click for larger image. If you’re curious about where in the world is this place, look here. Usage of the image above is granted under a Creative Commons Attribution-NonCommercial-ShareAlike 3.0 Unreported License. Abstract: Aquatic herbaceous macrophytes contribute significantly to the input carbon for the Amazon floodplain. These plants have large seasonal variations in areal coverage and high productivity. The present study estimates annual net primary production (NPP) of aquatic herbaceous macrophytes in a large lake on the eastern Amazon floodplain, assesses the sources and amount of uncertainty associated with these measures, and offers a comparison among the estimates of herbaceous macrophyte productivity in the Amazon region. Plant biomass accumulated during the rising water stage of the annual flood cycle, peaking at 2300 to 6100 g m-2 and decreasing later in the year. Annual net primary production was estimated to range from 2400 to 3500 g m-2 yr-1, with above water production between 650 and 1100 g m-2 yr-1, and below water production between 1700 and 2600 g m-2 yr-1. Echinochloa polystachya and Paspalum fasciculatum were the most productive species, followed by Paspalum repens, Hymenachne amplexicaulis, and Oryza perennis. The four main sources of uncertainty in the estimates were macrophyte taxa, location, sampling design, and lack of measurements of dead material loss.